It is not longer a distribution, but a lightweight IDE (like IEP was) that helps the user install a (miniconda) environment. Bundling the environment with the IDE caused several problems. It was a lot of work to maintain for us (which we do in our free time). Previously, there were two projects. 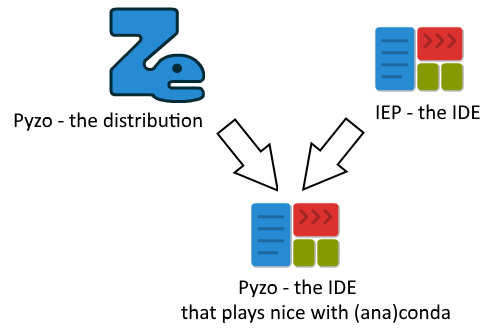 IEP was the IDE, and Pyzo was a distribution that made it easy to install a Python environment and the IEP IDE. Over the years, the conda environment (with miniconda and anaconda as its installers) have become increasingly powerful. In fact, Pyzo has been based on conda for a while. Nevertheless, the maintenance of Pyzo proved a significant burden, and we found that we were not releasing as often as we wanted. Furthermore, there were several cases of problems causes by the fact that the IDE worked from the same environment in which the computing was done, especially for updating packages. Therefore we decided to decouple the distribution; people can just install a conda environment. We made changes to the IDE to guide the user in this process, so that getting started is still easy as py. This site is proudly generated and served by Python.